18 pp. Roman, 206 pp. Koalib is a Kordofanian language belonging to the Heibanian branch. It is spoken by at least 100,000 people currently or formerly living in Sudan’s South Kordofan province. This book is devoted to the phonology of Koalib and has successive chapters dealing with its vowels, consonants, tonal system, syllabic structure, and orthographic traditions. This volume is the first part of a detailed, systematic description of this language. It will be followed by others on the morphology, syntax, and lexicon of Koalib. The dialect chosen for this study is Rere, spoken around the town of Abri in the heart of the Koalib linguistic area. 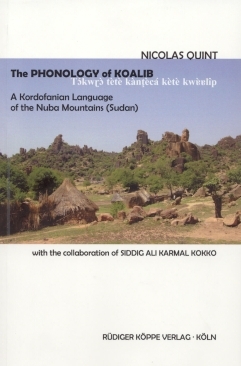 This Phonology of Koalib Language, the first of ist kind, is essential reading for everyone interested in the history, comparative studies, and classification of African languages. This English edition is a translation of the original French version entitled Phonologie de la langue koalibe which was published in 2006. Nicolas Quint was born at Poitiers (France) in 1970. He has a doctorate in linguistics from Université Paris III – La Sorbonne Nouvelle and is also a qualified agronomist. Since 2000, he has been working on the description of Koalib and currently holds the post of a “Directeur de Recherche en Linguistique Africaine” at the research centre LLACAN Langage, langues et cultures d’Afrique noire in Villejuif near Paris. Siddig Ali Karmal Kokko was born in 1962 in the Abri region of Southern Kordofan (Sudan) and is a schoolteacher in Omdurman. His mother tongue is Koalib (Rere dialect) and, as the principal informant, he has made a vital contribution to the successful completion of this study. Un travail comparatif sérieux sur la position du kordofanien à l’intérieur du Niger-Congo présenterait (…) un intérêt considérable, mais l’état actuel de la documentation sur ces langues, particulièrement mal documentées, interdit dans l’immédiat d’envisager une telle entreprise. La description de la phonologie du koalib que nous livre Nicolas Quint constitue de ce point de vue une avancée significative.